Spain's Playground For The Wealthy Becomes Corruption Scandal Epicenter : Parallels The Spanish island of Mallorca, a popular resort destination known as the "jewel of the Mediterranean," is in the spotlight now as Princess Cristina, the king's sister, goes on trial for fraud. 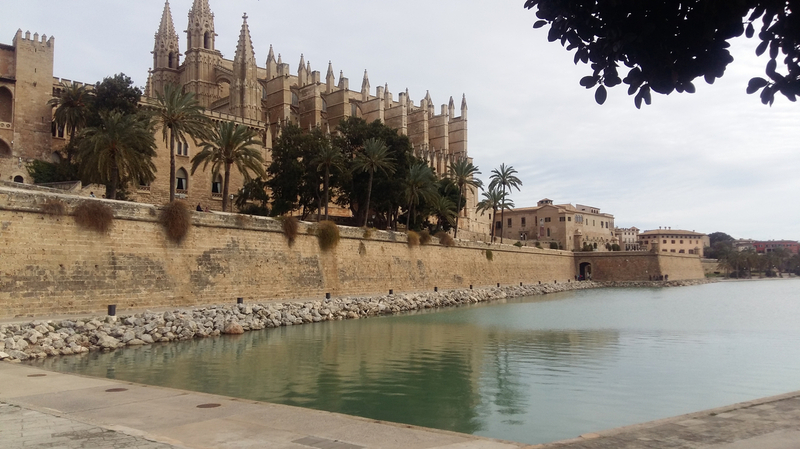 The Almudaina Palace (left) is one of two royal palaces on Spain's Mallorca island. Spain's royals don't keep their yachts at the Royal Yacht Club anymore. The posh nautical club on the Mediterranean island of Mallorca still hosts a King's Cup sailing regatta each year. But the Spanish royal family are no longer regulars. 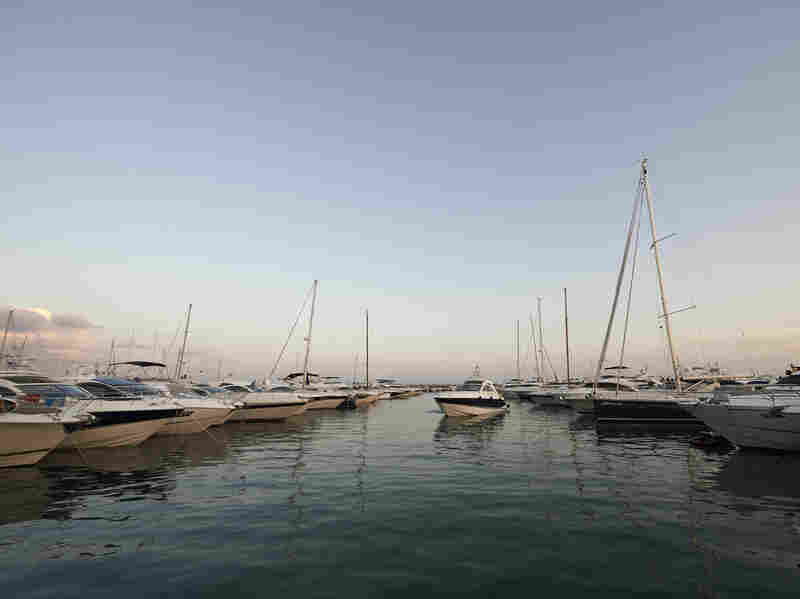 "Take a walk down the dock, and you'll see lots of empty slips where super-yachts used to be," says Alejandro Montojo, eating a sandwich on the deck of a boat for lease by the charter company where he works. "The royals used to be here all the time, but now it's all about austerity. They don't want to flaunt their yachts paid for by big businessmen." Spain's Princess Cristina (left) and her husband, former Olympic handball player Inaki Urdangarin (right) leave the courtroom in Mallorca on Feb. 9. Cristina, the Spanish king's sister, is accused of doing fraudulent business deals on the island. Urdangarin faces charges of embezzlement and money-laundering. One such royal yacht, the 136-foot Fortuna — a gift from Mallorcan businessmen to the former king, Juan Carlos — was sold three years ago at the height of the economic crisis. Tourism exploded on Mallorca, part of Spain's Balearic Island archipelago, after Juan Carlos began vacationing there as king decades ago. It quickly became a playground for Europe's rich and famous — like a Spanish Monaco. 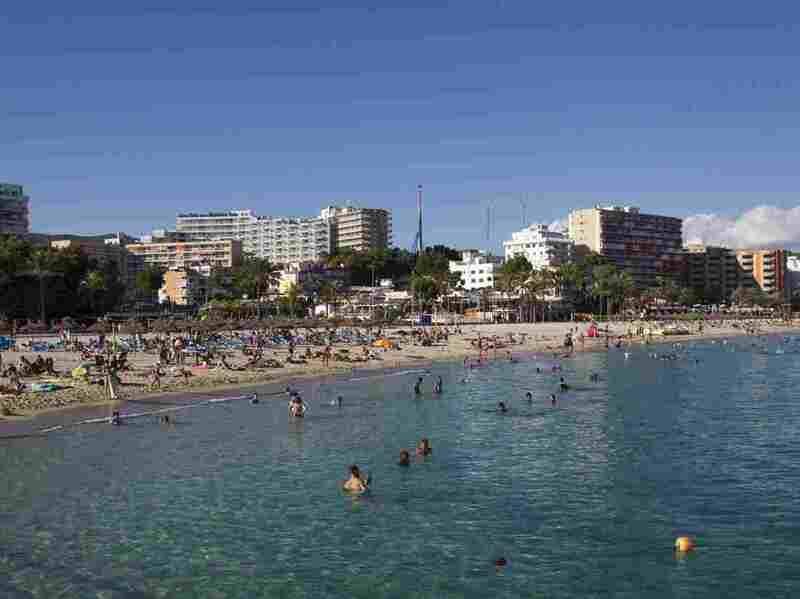 Its capital city, Palma, has two royal palaces towering over Mediterranean shores. But what went on in those palaces is now the subject of Spain's most-watched corruption trial. And Mallorca is at the epicenter of a massive corruption scandal. Princess Cristina, the Spanish king's sister, is one of 17 defendants accused of doing fraudulent business deals on the island. She's the first member of Spain's royal family ever charged in a criminal case, and faces up to eight years in prison if convicted of two counts of tax fraud. Her aristocratic husband, Iñaki Urdangarin, faces nearly 20 years for more serious charges of embezzlement and money-laundering. Their co-defendants include former business associates and 11 former government officials from the Balearic Islands, Valencia and Madrid. Testimony began this week in the historic trial — being held in a civil servants' training center, because Palma's courthouse is too small to accommodate so many defendants, plus the world's media. The trial is airing on live TV across Spain. The first to take the stand, in his own defense, was José Luis Ballester, a childhood friend of the royals. He was an Olympic sailor who won gold at the Atlanta Games, where Urdangarin won bronze in handball. They were friends, attended each others' weddings — and now sit together in the defendants' dock. Ballester was also a government official on the island of Mallorca — and is accused of helping Urdangarin win no-bid government contracts and eventually embezzle more than $6.5 million of island taxpayers' money. He's cut a deal with prosecutors to testify against Urdangarin and the others. Mallorca's Mediterranean beaches are popular among tourists. "Did you ever feel taken advantage of by the royals, for your access to power?" one of the prosecutors asked Ballester during proceedings. He hesitated, glanced at the other defendants behind him, and then down at the floor. "Yes, you could say I feel used," Ballester testified. On the stand, he described sealing fraudulent business deals over paddle tennis matches at the Marivent Palace, overlooking the Mediterranean. Another former official, Jaume Matas, told the court that he "was interested in keeping Urdangarin and the royal family happy," and therefore awarded contracts illegally to Urdangarin's sports foundation. Spain's King Felipe VI, Queen Letizia and daughters Princess Leonor (right) and Princess Sofia (left) attended the Royal Cup yacht race last August in Mallorca. Curious to see the Marivent Palace, where such fraudulent deals were signed, I ducked out of court, hailed a taxi and asked the driver to take me there — which set the driver off on a rant. "That palace belongs to the citizens!" said Sebastien Abram. "It's our public money that pays for them — and then they steal from us!" My taxi driver's reaction is typical of people in Mallorca — incredulous that rich royals might embezzle and cheat on their taxes. For Spaniards, this trial represents much more than the possibility of seeing their princess go to prison for tax fraud. It's about investigating corruption overall. "It's basically about connections, nepotism — friendships that turn into business. It is the whole way of operating that's on trial, really," says Ana Romero, a renowned Spanish journalist and author of a recent book about Spain's royals. "It's about politicians doing favors to have power and money. It's a very old story — and it's sad, actually, what it tells you about Spain." Romero says she hopes that way of operating in Spain is vanishing, as government officials and now even the royals are held to account. Small things are changing: A street through the island's capital city used to be called the Avenue of the Duke & Duchess of Palma, honoring Cristina and her husband. Now it's just called La Rambla — the Avenue. In the wake of the corruption trial, Cristina's brother, King Felipe VI, stripped them of their royal titles and Palma officials took down the street sign and changed the name. "I'm happy that it's not called that anymore," says Irene Alonso, a pharmacist I met on the renamed Avenue. "But I just think that this is something superficial in order to let people to think that they are changing. But in the roots, they are not changing." Spain's royals used to come to Mallorca's yacht dock "all the time," says a charter boat employee. "But now it's all about austerity. They don't want to flaunt their yachts paid for by big businessmen." Alonso worries that as Spain's economy bounces back from recession, people will forget about fighting corruption — and elites will just go back to their old ways. Mallorca and its sister islands in the Balearics had long been governed by Spain's conservatives — 11 of whom, former government officials, are defendants in this trial. Their alleged crimes came out at the height of the economic crisis here, when ordinary Spaniards were suffering. And last spring, the island's conservatives lost their majority in local elections. Now Mallorca is governed by a coalition that includes the left-wing, anti-establishment party Podemos. "It's like a mafia ran this island, and now all of our top officials are either in jail or on trial," says Jurado, a former firefighter and hotel worker who's the vice president of Mallorca's island council. He's a Podemos member. Jurado says he's sorting through government contracts to see which ones are fraudulent. And he's drafting a petition that would require Spain's royals to keep just one palace here — instead of two.